Hope you’ve all had a great weekend. I can’t believe it’s only like 6 weeks until Christmas! I mean I’m sure it was only a few weeks ago we were bringing in 2016! I’m definitely starting to get into the Christmas spirit though. We visited the Manchester Xmas Markets on their opening weekend and you could tell just how excited everyone was and I really don’t blame them. I adore this time of year when the lights come out and I’ve got to start thinking about what to to get everyone. Yes it can be frustrating at times but come Christmas Morning you know it’s been worth it. Before we get to that though I’m still publishing recipes for you guys. Today’s is a pretty easy (but healthy!) one. 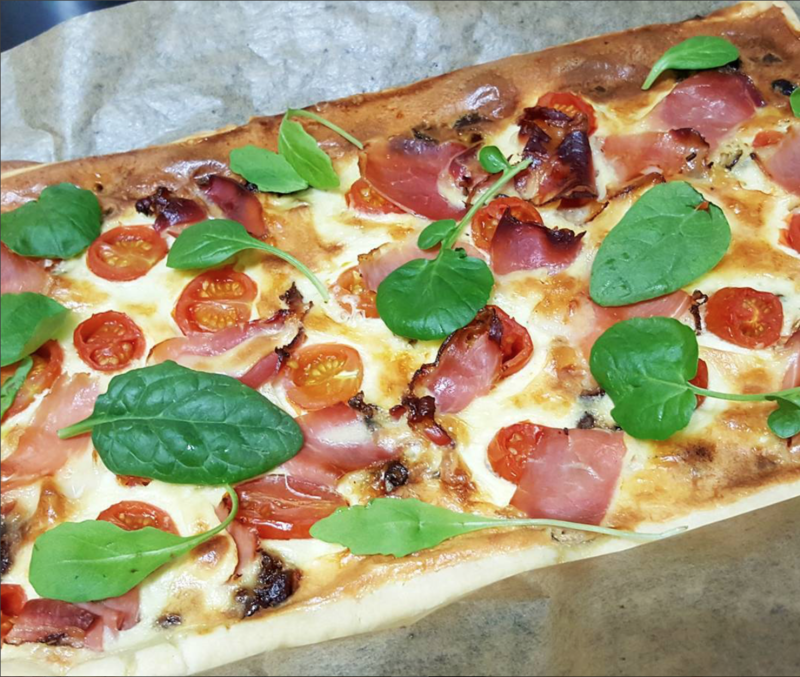 It’s a BLT Tart and has plenty of tomatoes, lettuce and bacon (once the prosciutto is fully cooked!) just be aware it’s very sweet! Enjoy! Place a large enough baking sheet inside an oven tray and then roll out the pastry sheet onto the lined tray. Spread out the chutney across the pastry sheet leaving a 1cm border on each side. Fold over the border at the sides and pinch it to create a raised rectangle from the pastry. Pre-heat the oven to 180C (conventional) or 160C (fan-assisted). In a large mixing bowl add the creme fraiche, grated cheddar and eggs, then mix well with some ground pepper until runny. Carefully pour the mixture onto the pastry so it fills the whole case. Add the halved tomatoes and prosciutto slices, add some seasoning then cook for 35-40 minutes until the filling has set and the pastry has baked. Once finished cooking remove from the tart from the oven and top with mixed salad leaves.